How often do you get so busy you forget to take care of yourself? When you work for yourself, it’s not an option. Self care is a business activity, not an afterthought. You are the first resource of your business, so you better take good care of yourself to take good care of your business! 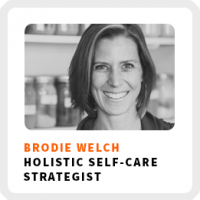 Brodie Welch shares how to practice self care when you work for yourself. She’s a holistic self-care strategist, a licensed acupuncturist, herbalist and Chinese medicine expert. I met her at ConvertKit’s Craft + Commerce this past summer and was so energized by her passion for self care. I recently invited her to speak to our Accelerator members and her sessions was one of the most popular! Definitely check out her podcast A Healthy Curiosity on your favorite podcast app, as well as her courses and retreats! How your work life and personal life can intertwine to help each other flourish. Define what productivity means for you. Create an engaged audience by talking to them in the real world to truly understand what’s bugging them and how you can help them. Create routines and habits to reduce decision fatigue. Ideal work environment: In the morning, after starting her day right, with a treadmill desk. Superpower: Blending compassion and strategy to help people get unstuck. 90-day goal: Enroll at least 8 people in her coaching program, develop a “what comes next” piece for people who have already been through the course, and fill her retreat in Mexico. 1) Expanding her consciousness out as big as possible, before getting out of bed. 2) Aligning with gratitude as a gateway to a loving state. 3) Hydrating to flush the system and engage the metabolism. 4) A meditation practice that doesn’t always look the same, but is non-negotiable before leaving the house.